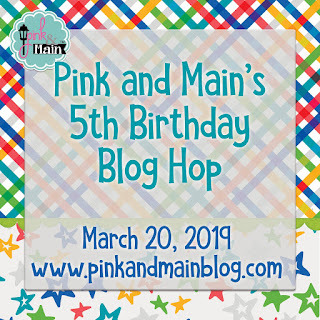 today we are celebrating Pink and Main’s 5th birthday!!! 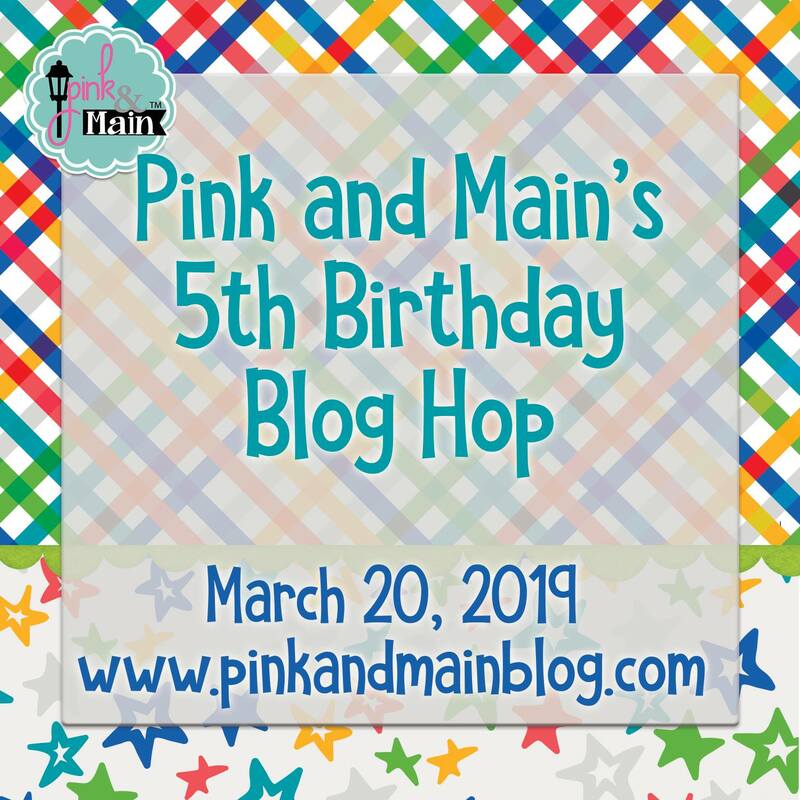 And what is the better way to celebrate than with a blog hop and giveaways! If you are following the hop you have probably arrived from Leanne’s blog and your next stop is Laura. Also today we are celebrating the March release, too! So, for today’s card I used the Party Balloons set and coordinating dies along with the Celebrate set and dies. There will be FIVE random winners chosen from the comments left on our blogs. You must comment on all blog stops to win. I like the frame behind the balloons. I have never thought of using a frame this way but I like it. The embossing on the balloons looks great. Nice job. Oh, I love this soft lokifthis - just so pretty! The soft look of this ... in English, this time! A very sweet card!! Love it!! You really can make so many different cards with all the new release items and they are so awesome. What a beautiful card. I love the way you framed the elements. Thanks for sharing with us. Love these balloons- great card! Elegant and tasteful. Very nice. Great design with the frame behind the balloons! Very cute card. Love the gorgeous balloons. Beautiful! I love the CAS look with the balloons! The frame behind the balloons really makes them pop. Love those pretty balloons! Great color combo! Beautiful card, love the layering and just everything! So pretty! Love the white card with the white scalloped rectangle as a backdrop to the colorful balloons. Balloon images always make me smile! So pretty. I like the colors of the balloons and the framing. Those balloons really pop against the layered white background! Gorgeous! Beautiful card! Love all the white space. Such a lovely card! Love the layers. Such a clean and simple card, but so effective Ilina. Wonderful release from Pink and Main. Love your festive card!! Very colorful and simple but fabulous!! Love the fun designs on the balloons! Very pretty card! Such a beautiful card!! A lovely job!! Pretty card, Ilina! I love the Spring colors and the festive balloons. Oh what a fun and festive card! Beautiful colors and composition. 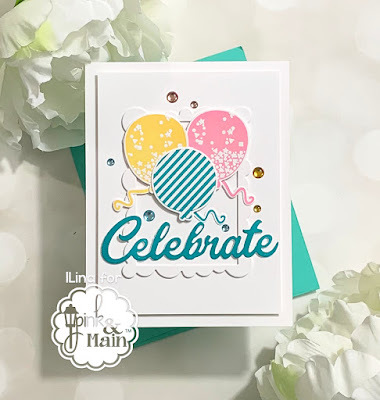 Wow--you have done an amazing job creating a fun and elegant card! Love it! Absolutely love your balloons with embossing, great inspiration! Love this simple and sweet card, lovely colors. Beautiful card! I love your design and the white frame was just the right touch! Thank you for sharing! 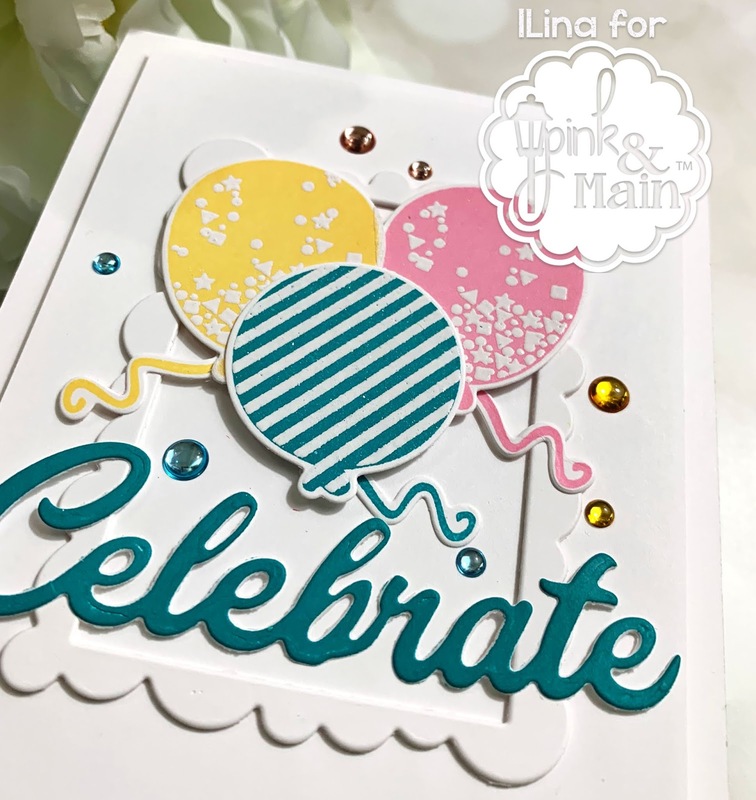 Fun card - great colors! Great design on this elegant card.